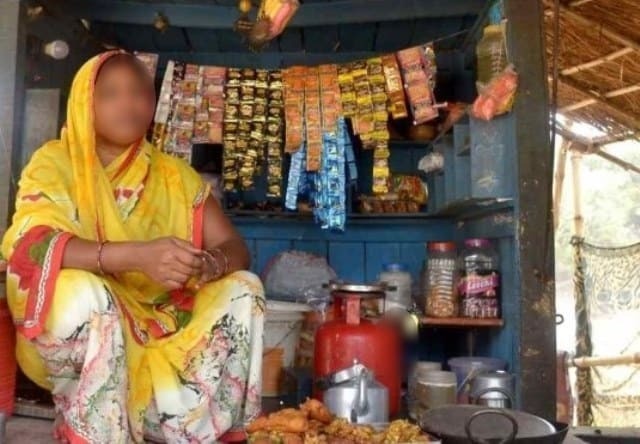 Widowed at 23, Radha (name changed) set up a tea shop and initially made just enough to make both ends meet. Now, she performs multiple tasks at the same time from selling wares, to taking care of her two young children, keeping books of her stock, and cooking at home. Her biggest worry however, is to fend off unwanted suitors who believe she is desperate for male company. I lost my husband four years after my marriage. I was 23 then, with two very young children. I was completely at loss about how I would spend the rest of my life. There were very little savings, so I lived from day to day with help from friends and close relatives. Then I decided I cannot bring up my children on charity forever. I was 24 when I, with some financial help from parent, set up a small tea shop using mostly my own houseware. That was four years ago. Today, I also sell cigarettes, gutkha pouches and packed snacks, all manly items. While I am a much more confident person today, it wasn’t an easy going in the initial months. A shop teaches you a lot about how to use your resources, price your goods and haggle with suppliers. But nothing is more frustrating than keeping those Romeos at bay who think a single woman is desperate to pair with men. Since my shop is near my house, most customers know my status. Even occasional ones figure out that I am single woman. This clearly sets their hormones raging. Many of these are married men just looking forward to having a good time or just trying to get verbal gratification. Some of them begin with ‘polite’ sympathy, others use sly compliments, yet others keep staring. But the most difficult ones are those who share sob stories: about how they are in an unhappy marriage. Liars, all. My shop is very small (about 10 sqft) which means I have to sit in close proximity to men all the time and sometimes it becomes discomforting when these men are constantly staring at you from such close quarters. At times, men try to act fresh and brush past you at the pretense of pushing a glass or fumbling at a gutkha pouch string. Initially, I got very worked up at their behaviour. But now if someone ‘mistakenly’ touches me, my hot saucepan in which I prepare tea also ‘mistakenly’ touches them. However, I take care that they don’t get burnt; just a slight touch to make them realise what a woman feels about an unwanted touch. There are men who overstay at the shop engaging in idle talks and showering false compliments. Sometimes I have to manage drunk clients who can’t decide which brand of gutkha or cigarette they want. But all that is routine for any shop owner. There are nice men too who genuinely respect women. What I miss is socialising with women. All my customers are men who discuss politics, films or their hardships. I hardly get time to meet a woman and speak my heart to her. There is no one to turn for advice either; little time to visit relatives. I often have an urge to unburden my feelings. I’m but human and I do feel lonely at times. All I can do perhaps is wait from my girl child to grow up and then maybe the two of us can share each other’s anxieties and experiences at length.